despite seriously feeling like I was! All I have to say is that when you add a cold/cough to being 36 weeks pregnant you get some serious suckage. At some point early in the week, I pulled several muscles in my back with my hacking cough. Unfortunately, Tylenol doesn’t really help me much for muscle ache and it is a bit hard to get comfortable. After a week the cold is finally getting better and I hope the back will follow as I am not restraining the same muscles every time I cough. With this cold, I think I have gotten to the point where I would not be too upset if Baby Saunders decided to show up a bit early. As my parents are out of town this week, he has to wait until the 12th, but after that I am cool with whatever he decides. I think we are as ready as we will ever be for this big change. Despite feeling icky, I did spend some good time stitching. I did my 5 hour rotation on Mystery 9 and made a good start on a second one of the big corners. Here is what that corner is looking like now. I also made a good start on Karen’s neighborhood RR. 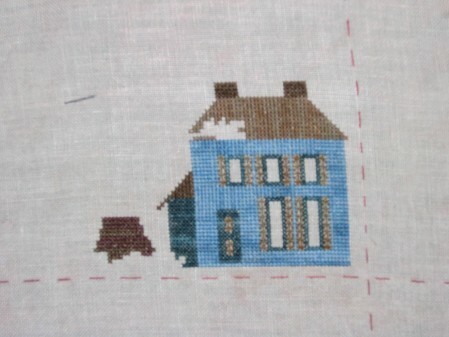 I am stitching the house from Bittersweet Moon by Blackbird Designs. I am all finished with the house and made a good start on the tree. The big hole in the roof will eventually be a leaf from the tree. I am hoping to have the trunk of the tree done this evening and finish up with the leaves tomorrow. Then I will be done with obligation stitching until next year. Yeah! I am also totally stoked because my dragon RR made its way home this weekend. It looks fantastic and I can’t wait to do the finishing on it. I decided to frame each dragon individually so that I can play around with the way I want to display it. I just need to find some nice 4 inch square frames and go to town. Thanks Christine, Outi and Jenna for such a wonderful experience!! Mystery 9 is coming along nicely and your house for Karen’s rr look great. *hugs* Hope you are feeling much better now!!! oh my, sorry to hear about your cold/cough. I had a nasty one a month ago & it was dreadful. After I finally was over it, I got a flu shot!!! Meanwhile, your RR and mystery are aweseome!!! WOW. Ooo, I love your work on Karen’ RR – she will love it too! Oh my gosh, we are counting down to zero now, aren’t we?? When do you leave work? I love the swirls in the corners of your Chatelaine! Great job on the RR that’ll be done in no time. Isn’t it nice to be obligation free for a bit? That’s why I always work on RR’s as soon as they show up. Your M9 is looking gorgeous! 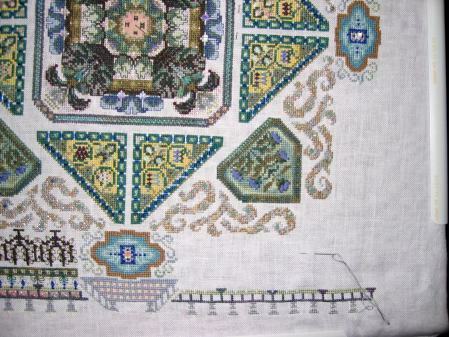 I’m pulling mine out to stitch on as soon as I finish Baby Garden. I so want M9 hanging in my bedroom!